When The Outer Church raises its multiple voices in unholy discord (a la the intro to Children Of The Stones) to proclaim that something a bit special is coming up, best believe it's the truth. 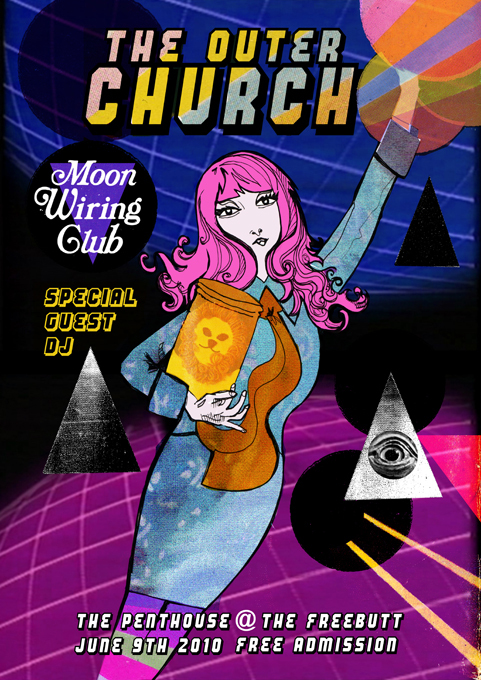 For the June 2010 edition of t'Church will feature Special Guest DJ Ian Hodgson aka Moon Wiring Club conjuring - in his words - "AN ELECTRONIX FIZZPOP SLURRED ITALO SYNTHPOP SPACE EXPLOSION" ...with perhaps the odd chip from the chocolate fireball himself, Joseph Stannard. Um, that's me. For a taste of Moon Wiring Club's eldritch steez, download Ian's superb Solid Steel Mix for Ninja Tune here. Want more? Course you do. Ian's exclusive ASDA Mix for The Wire is available here. Lawks! There's a free 4-track EP to download here. And of course, you really should purchase all three Moon Wiring Club albums from here. When I first received my unsolicited copy of London Transmissions by Onethirtyeight, I eyed it with suspicion. Although the title and artwork piqued my curiosity (shades of Mordant Music's Dead Air) the logo led me to expect something along the lines of Entombed circa Wolverine Blues, The Misfits, perhaps even - shudder - The Meteors. My first impressions were not c-o-m-p-l-e-t-e-l-y off the mark. For one thing, The Misfits have a song titled 'We Are 138'. For another, the reviews collected in the press section of Onethirtyeight's website are taken almost exclusively from metal, punk and industrial magazines and websites. However, their tone of perplexed approval offers an indication that the mysterious unit are peddling something other than standard mosh fodder. Onethirtyeight's music isn't metallic, punkish or industrialised. It isn't even particularly aggressive. What it does sound like is a worthy sequel to Mount Vernon Arts Lab's magnificently creepy The Seance At Hob's Lane. Who'd have thought...?